There has been a lot of talk recently about Google’s latest search algorithm release, Penguin, and the negative impact that it has had on businesses. Some of the previously top-ranked websites have seen their traffic plummet dramatically, and are scrambling to recover. The question is, why are these business owners so surprised? Penguin isn’t some kind of game-changer, it’s simply Google’s attempt to enforce the rules that have already been in place. For far too long, a lot of business owners have been taking the “easy route,” using gimmicks to increase their web traffic, instead of doing the hard work of laying a solid foundation through an effective inbound marketing plan. It’s important that you know what Penguin means for your business, and how to avoid being hit hard by future algorithm releases. 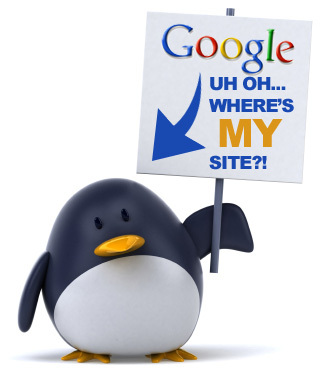 On April 24, Google rolled out a new update to their Panda search algorithm, which they named Penguin. It is not an entirely new algorithm, but included a series of updates for the purpose of reducing web spam. The update targets sites that use keyword stuffing, duplicate content, article spinning, forced anchor text and hidden links in an attempt to rise to the top of the search engine result pages. All of these practices have been prohibited in Google’s webmaster guidelines, but that has not stopped the increasing number of business owners, who have used these ‘unethical’ SEO practices in order to increase their web traffic. If you are an owner who has suffered a loss in web traffic due to Penguin’s release, or would like to ensure that your business doesn’t fall prey to a future algorithm release from Google, the answer is simple. In order to grow and maintain your business in the competitive online marketplace, you need to focus on how to design and implement a comprehensive inbound marketing strategy. This includes the creation of powerful, relevant, frequent content that is written with your audience in mind first, and search engines second. Truly successful businesses have an inbound marketing plan that is multifaceted, with content, social media, user experience, merchandising and so much more. It is possible to play within the rules, and still have a successful business online. Building a community should be the top priority of your inbound marketing plan. Through increased use of social sharing on Facebook, Twitter or Pinterest, users will be actively engaging with your brand, and you can help build trust and credibility with both potential and existing customers. Also, improving the look of your website, through improved navigation and page titles will also go a long way towards enhancing your site’s overall user experience. If you do the hard work of creating content that connects, your business will naturally rise to the top of the search engine results. We’re not saying eliminate your optimization, as obviously some level is advantageous. But there is a difference between optimization and manipulating the system. It’s time to let go of the unnatural linking, and fill your website with real, organic content. If you focus on creating quality content that is relevant and useful, then users will find their way to your site without the use of gimmicky optimization. Content is king. A site-wide content creation strategy is important in order to ensure your business stays relevant in the long-term. Updating your website on a weekly basis with fresh, new content is a must. Find your business’s niche, and build upon it with weekly blog posts, articles and other information that users will find useful. If there is one thing to be learned from Penguin, it is that over-optimized text can be dangerous, because it leaves your business vulnerable to future algorithm updates. Although taking the time and effort to design an inbound marketing strategy sounds like a big investment, following best practices and laying a solid marketing foundation will save you from scrambling when the next update is released. PreviousPrevious post:Legitimate or not, why posting testimonials on your website is junkNextNext post:Is Email Marketing Doomed To Fail?